When we rolled out of bed this morning and began preparing to leave, it was still dark out. We thought we’d be the only ones up and about that early in the morning, but several of our other fellow overnight campers were also anxious to pull out of the sketchy campground. Like us, they probably couldn’t sleep either as they waited for the disgruntled former resident evicted the night before to return and cause more problems. We all ended up getting an early start with everyone out of the campground and on the road by 7:00am. With a heavy fog suspended in the air, we could barely see the road in front of us. Driving blindly ahead felt as if we were floating into a cloud. Eventually, the foggy haze evaporated, revealing the vast stretches of flat Texas plains. 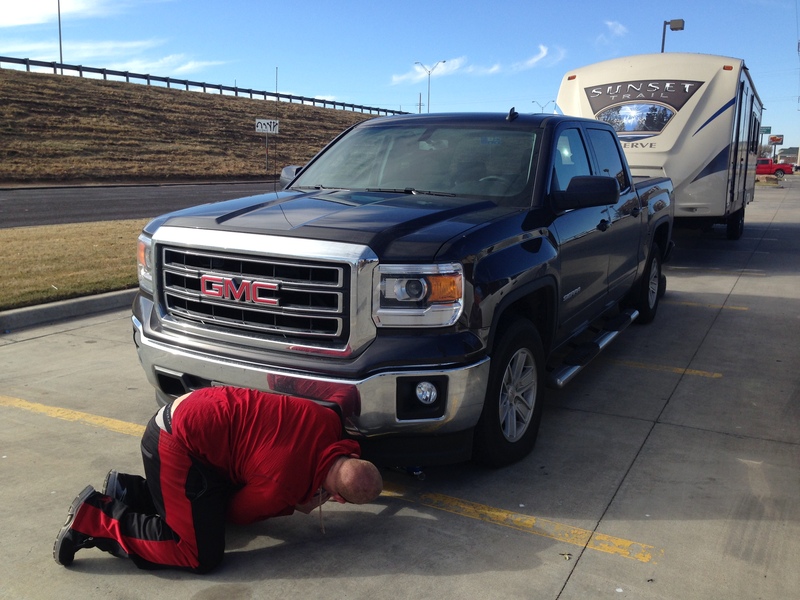 As we approached Amarillo, TX, we were surprised by an alert from our truck that one of our tires was low (24 psi instead of the regular 35 psi)! Can you believe we got a flat tire with only 2 stops left (New Mexico & Arizona) before reaching our final destination (California)?! I guess after driving over 30,000 miles through 48 states during the past 7 months, we were pretty (okay…incredibly) blessed this was the first and only flat tire or problem we had with our truck. We were also lucky it was Sunday morning! This meant that most of the businesses were closed, which also meant that their parking lots were empty. We were able to pull off the highway into an empty parking lot large enough to accommodate our truck and trailer while our flat tire was fixed. It’s never easy to exit a freeway and find parking while towing a 35-foot travel trailer. But this time, for some reason, it was. Hallelujah! Sometimes you have to find the silver lining in situations. It could have been so much worse! Finally getting our flat tire replaced! That still left us with the task of replacing our flat tire though. But, rather than go through the hassle of changing the tire ourselves, we decided to take advantage of our free roadside assistance. YAY for free roadside assistance (or so we thought)! OnStar sent someone out to us, but instead of the guy arriving in 30 minutes like he was supposed to, he took 1 hour and 15 minutes! We probably would’ve been better off just changing the flat tire ourselves rather than waiting around for someone else to come do it. Oh well. We had no idea it would take as long as it did, but at least it was taken care of, and we were able to get back on the road! There was nothing in sight for miles during the majority of the drive from Oklahoma, through Texas, to New Mexico. Most of the terrain was just boring expanses of barren land. But then…there they were…real West Coast mountains! We never knew we’d be so excited to finally see mountains (real West Coast mountains) again. The sight was exhilarating yet also ominous, warning us that the end of our travels was near. Another reminder was when we made it to Albuquerque, NM, one of the last places we’d be stopping at on our return to California. Another early morning had us awake when slivers of sunlight were barely piercing through the darkness. The temperature of the winter dawn was just 37 degrees with a layer of ice covering the windshield. Who knew Albuquerque got so cold?! 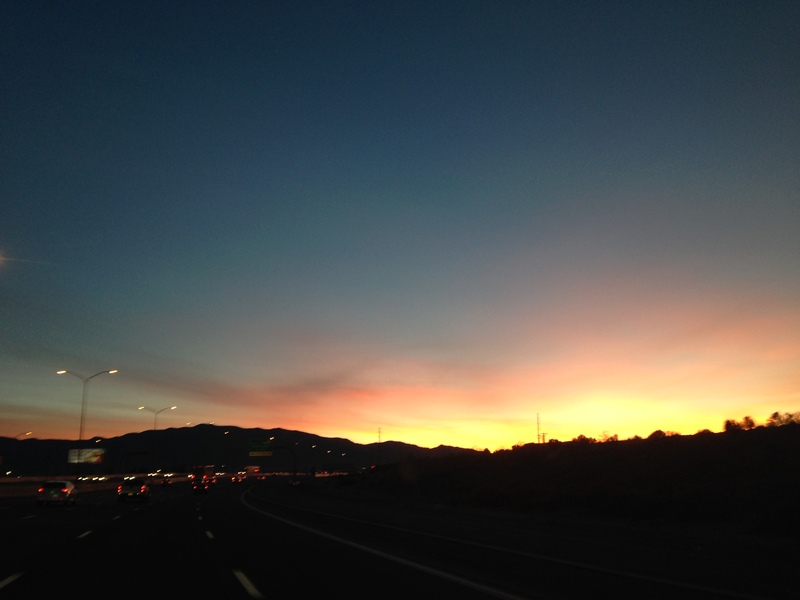 As we were driving, the sunrise became more and more alive, lighting up the atmosphere. Even though I’m not a fan of desert landscape, I’ve always loved the sunrises and sunsets in the desert with the shadowy silhouette of the mountains in the foreground of the blazing sky. The reason we were up before the sun was because we had to take care of some business before proceeding to Arizona. We arrived at the GMC dealership right when they opened at 7:00am for the last oil change of our trip (we’ve logged over 31,000 miles on our odometer!). We thought about also getting a new tire while we were there but decided to hold off. The oil change alone already took two hours, and it would have been another hour for them just to get the tire we needed in addition to the time it would take them to install the new tire. Since our spare was a full-size tire rather than a donut, we opted to replace the flat one later and took off to reach Arizona at a decent time. Even though this is the final drive of our cross-country journey, it won’t be our last adventure! Traveling has permeated the fibers of our beings and officially become an integral part of our DNA and way of life. Our lives are forever changed! From now on, we will always be on the lookout for exciting new places to visit and explore. As a matter of fact, we’re already planning our next road trip (stay tuned)! When we crossed from Arizona into California, realization hit us. We had come full circle! We did it!!! 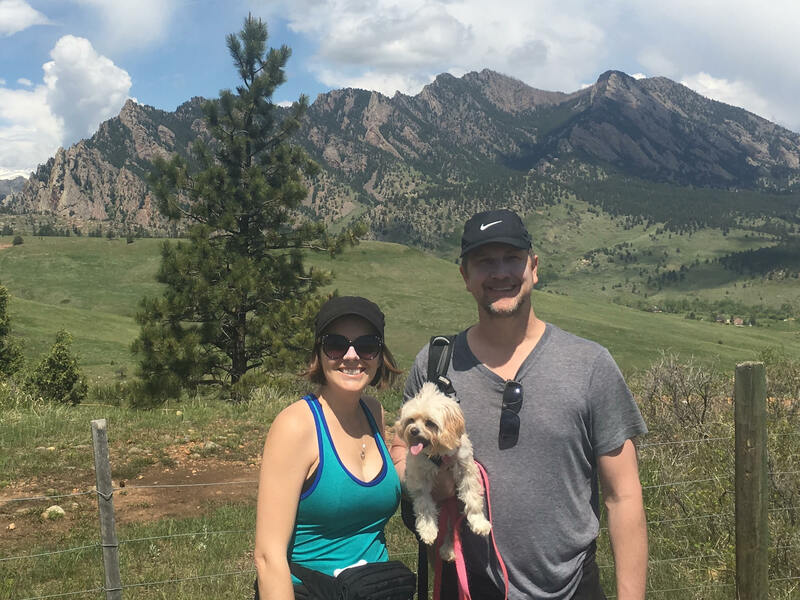 We accomplished our goal of RVing through the country and seeing each of the 48 contiguous states! And we did it without getting divorced or murdering each other (both an added bonus…haha)! What an amazingly transformative experience! 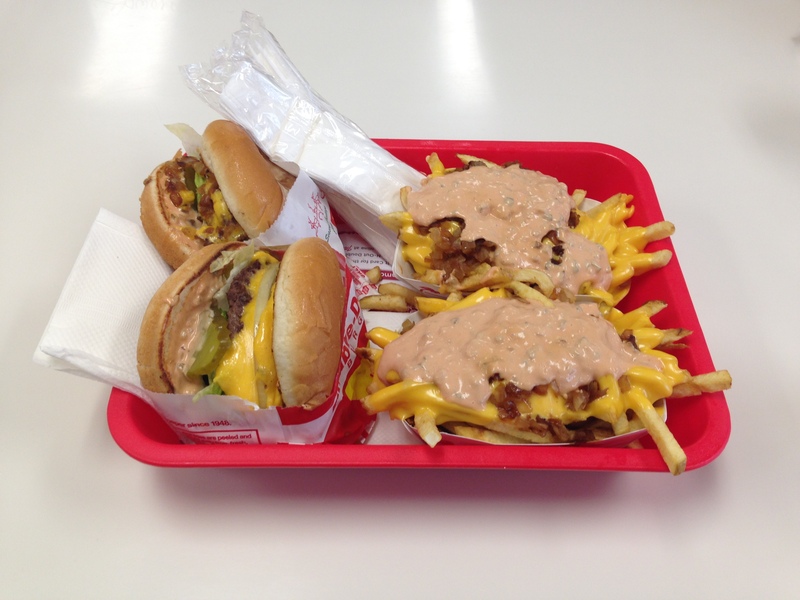 In-N-Out (the first place we went in Cali! It’s good to be back (at In-N-Out)!!! 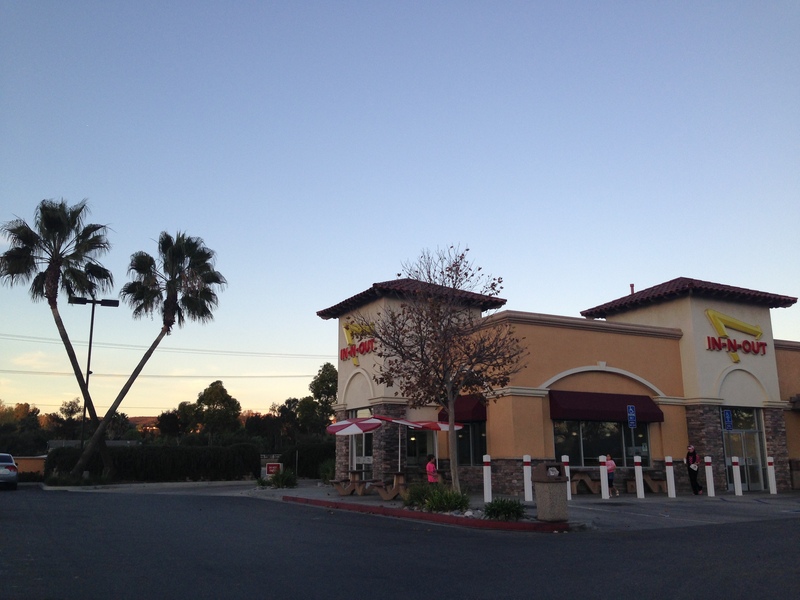 When we reached Temecula, CA, we breathed a sigh of relief knowing that we could stay put for a while. This would allow us to decompress from all the driving and sightseeing we had done while traveling over the past 7 months. Plus, we’re still not 100% sure where we want to settle down, so this will give us some time to figure things out. For now, home is still wherever we park it!